nnapolis Lodge No. 89 has been using our current building since 1888 for lodge meetings. This historically significant building has been owned by the Freemasons in Annapolis since 1900 and the members of Annapolis Lodge No. 89 are proud to call it home. he building is the sole remaining building in the 18th Century, Mann's Tavern complex. The property at 162 Conduit street was owned in the 1750s by Henry Woodward. The property had a large house on it that faced Church (Main) Street and was the Woodward family residence. Henrietta Maria Dulany bought the property after Woodward's death in 1761. In 1766 Lloyd Dulany inherited the property from his mother and lived in the old Woodward house. Dulany was loyal to the crown during the American Revolution and he fled Maryland in 1776. Dulany was later killed in a duel with Rev. Bennet Allen, a former St. Anne's rector. The state government confiscated the property and the Commissioners of Confiscated Property sold it to George Mann in 1783. When Mann bought the property, it was intended to be his home, but served only briefly as a residence. Indeed, he might not have lived in the mansion at all, although it was used as transient lodging for his guests. There are references to the Tavern as the site of official meetings, grand assemblies and galas. In many instances, however, it is not clear from the dates of the various structures, which events were hosted in which buildings of the property. George Mann's business was doing very well and in 1787 he expanded his complex by building the current Annapolis Lodge No. 89 Temple. This large three-story, five-bay Flemish bond brick building was part of George Mann's tavern and sometimes called the City Tavern. Most guests stayed in this new building after its construction. n November 21, 1783, the officers from Maryland that served during the Revolution gathered at Mann's Tavern to form the Maryland state Society of the Cincinnati. This meeting took place before the construction of our current Temple, so the meeting was most likely held in the old Woodward house on the Mann's Tavern complex. The Society is the oldest military hereditary society in the US. The main purposes for its creation was to provide fellowship among the officers of the Continental Army and to raise money to assist families of the original members. This society still exists in the original 13 states and in France. t is was once believed that the existing edifice was the site of the Annapolis Convention of 11 September 1786 but evidence now shows that construction of the "new" building was not started until a year after this event. The Annapolis Convention was called to discuss the need for a more powerful form of constitutional government. Alexander Hamilton and James Madison were the chief proponents of the Convention, having found that the Articles of Confederation failed to provide a sufficiently powerful congress - with power to raise funds, etc. Hamilton, a Freemason attended as a Commissioner from New York, Madison as a Commissioner from Virginia. The meeting adjourned quickly with the most important outcome being an agreement to meet again in the spring of the following year in Philadelphia, where the Constitution of the United States was argued and agreed to. rior to the Convention, Annapolis was the seat, for several years, of the peacetime Congress under the Articles of Confederation. When Congress was in session, Mann's Tavern was the lodging or dining spot of choice for Washington, Hamilton, Jefferson, John and Samuel Adams of Massachusetts, Caesar Rodney of Delaware, Randolph of Virginia and many others. Chase, Paca, Lloyd, Tilghman, Goldsbourgh and numerous Carrolls, all of Maryland were almost certainly present. 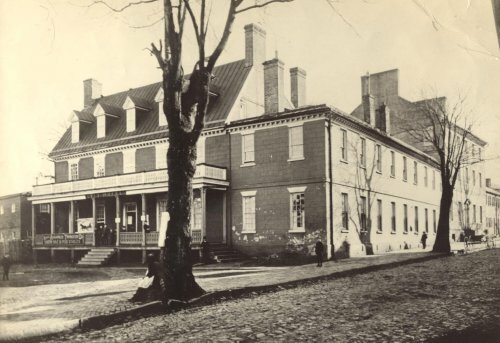 eorge Washington stayed at Mann's Tavern when he was in Annapolis to resign his military commission as Commander-in-Chief of the Continental Army on December 23, 1783. Thomas Jefferson was summoned to Annapolis to arrange his lodging and to find a party site for the more than 200 dignitaries that would be present. Mann's Tavern was the obvious choice and he carefully selected several wines from Mann's wine list for the 13 toasts that Washington would receive. Jefferson spent $644 on the wine for this event. Thursday 24th. Left Chester town about 6 Oclock. Before nine I arrivd at Rock-Hall where we breakfasted and immediately; after which we began to embark--The doing of which employed us (for want of contrivance) until near 3 Oclock and then one of my Servants (Paris) & two horses were left, notwithstanding two Boats in aid of The two Ferry Boats were procured. Unluckily, embarking on board of a borrowed Boat because She was the largest, I was in imminent danger, from the unskillfulness of the hands, and the dullness of her sailing, added to the darkness and storminess of the night…after 8 Oclock P.M. we made the mouth of the Severn River (leading up to Annapolis) but the ignorance of the People on board, with respect to the navigation of it run us aground first on Greenbury point [entrance to the Severn on the north] from whence with much exertion and difficulty we got off; & then, having no knowledge of the Channel and the night being immensely dark with heavy and variable squalls of wind-constant lightning & tremendous thunder-we soon grounded again on what is called Hornes point [present-day Eastport] where, finding all efforts in vain & not knowing where we were we remained, not knowing what might happen, ’til morning. Friday 25th. Having lain all night in my Great Coat & Boots, in a birth not long enough for me by the head, & much cramped; we found ourselves in the morning with in about one mile of Annapolis & still fast aground. Whilst we were preparing our small Boat in order to land in it, a sailing Boat came of to our assistance in wch. with the Baggage I had on board I landed, & requested Mr. Man at whose Inn I intended lodging, to send off a Boat to take off two of my Horses & Chariot which I had left on board and with it my Coachman to see that it was properly done--but by mistake the latter not having notice of this order & attempting to get on board afterwards in a small Sailing Boat was overset and narrowly escaped drowning. Was informed upon my arrival (when 15 Guns were fired) that all my other horses arrived safe, that embarked at the same time I did, about 8 Oclock last night. Was waited upon by the Governor (who came off in a Boat as soon as he heard I was on my passage from Rock hall to meet us, but turned back when it grew dark and squally) as soon as I arrived at Mans tavern, & was engaged by him to dine with the Citizens of Annapolis this day at Manns tavern and at his House tomorrow--the first I accordingly did. Before dinner I walked with him, and several other Gentlemen to the State house, (which seems to be much out of repair)--the College of St. John at which there are about 80 Students of every description--and then by the way of the Governors (to see Mrs. Howell) home. hen dawn broke and the fog cleared, the President was rescued by a sailboat and Brother Washington was taken to Mann's Tavern where he rested and refreshed himself. He stayed in Annapolis for two days before proceeding on his way. fire completely destroyed the old Dulany house and slightly damaged our Temple in 1919. In addition to the repairs, the members had an addition built in the back that included a kitchen and a dining hall, known as the Gassaway Room. The third floor was removed to give the lodge room a twenty foot ceiling with a balcony. A decision was made to remove the dormer windows from the attic to give the appearance of the building as it is today. he history of Annapolis, the “Athens of America”, and the fledgling republic is tied to Mann's Tavern. 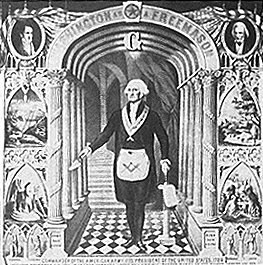 Many of the men who rejoiced and labored together at George Mann's were Freemasons, which marries the significance of Freemasonry to both place and government. How remarkable, how serendipitous it is, that this edifice has served as the home of Annapolis Lodge No. 89 for the past 119 years. After numerous failed lodges and the loss of at least one major building owned by one of them, a successful lodge was chartered and eventually housed at 162 Conduit Street. The brethren probably did not know how close they were to their own roots. he architecture, political history and history of Freemasonry in America are sufficient to consider this building in the "world class." Its proximity to the Capitol house of the State of Maryland and to the first meetings of Freemasons in America secures its symbolic image of importance to Masons in the State. It may be used as a stage from which the intrinsic values of Freemasonry may be viewed in the community. 1787 George Mann. George Mann built the building that is the current Masonic Temple in Annapolis. 1795 - 1810 Mary Mann. Mary Mann was the wife of George Mann and inherited the property after his death in 1795. 1810 - 1816 Anne Mann, Sally Mann. Anne and Sally were the daughters of George and Mary Mann. They inherited the property after the death of their mother in 1810. During the time they owned it, they rented the property to William Brewer who operated it as City Tavern. Anne and Sally Mann, through the property trustee, transferred the property To Charles Carroll and the 19 other parties listed above. Charles Carroll was a member of the Continental Congress, Maryland General Assembly, and US Senate. He was the last surviving and only Catholic signer of the Declaration of Independence. Contrary to what was portrayed in the movie National Treasure, Carroll was most likely not a Freemason. Sale Notice. 1828 - 1831 William Brewer. The coalition of 20 owners divested their interest in the property to William Brewer. Brewer was in the Maryland House of Delegates. Maryland Gazette Notice - 1817. 1831 - 1833 James Williamson (member of Annapolis Lodge No. 71). Brewer sold the property to James Williamson for $16,000. During this time period, the property was known as Williamson's Hotel or Union Tavern & City Hotel. 1833 - 1848 Richard Swann, James H. Iglehart. Willimason sold the land and buildings to Swann and Iglehart for $21,600. They operated under the name Swann & Iglehart Hotel. Richard Swann was mayor of Annapolis from 1846 to 1848 and a former member of the Maryland House of Delegates. 1848 - 1870 John Walton. 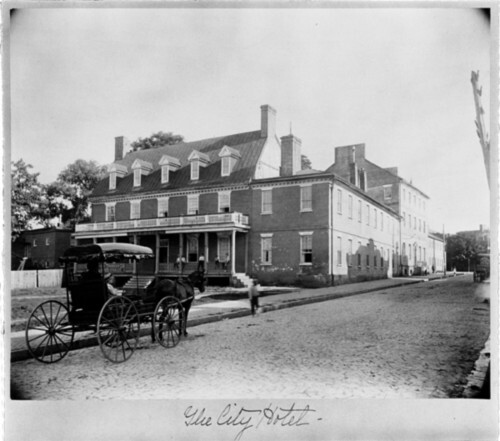 The property was sold to Colonel John Walton of St. Mary's County and he operated it as the City Hotel. 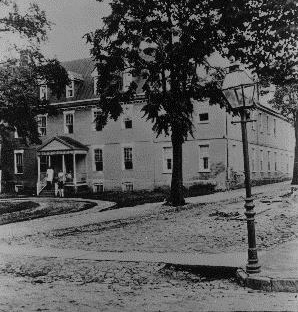 In 1857, Walton built an addition all the way back to Duke of Gloucester Street. This is known today as "Rainbow Row." The hotel was apparently closed in the 1860s. 1870 - 1872 Edward Walton & Bros. The ownership of the property was reorganized within the Walton family and owned by the sons of John Walton. 1872 - 1876 J. Randolph Walton. The brothers Edward and Henry Walton sold their interests to their brother Dr. J. Randolph Walton, an Annapolis dentist. 1876 - 1900 William H. Gorman (member of Annapolis Lodge No. 89), Luther F. Colton. Walton sold the land and buildings to Gorman and Colton for $14,500 in 1876. The complex was operated as the City Hotel once again until 1884. Annapolis Lodge No. 89 started meeting in the building in 1888. 1900 - Eugene J Griffin, L. Dorsey Gassaway, et al. Trustees for Lodge No. 89 Associated Free Masons. Gorman and Colton sold off different buildings from the original complex around the turn of the century. 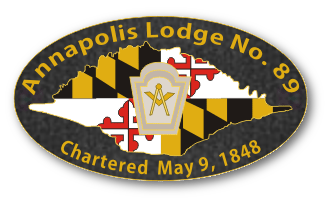 Annapolis Lodge No. 89 bought the building that is the current Masonic Temple in 1900. Deed. Translated Deed. 1878 Map - Shows City Hotel and Masonic Temple on Maryland Ave.